According to national meteorologists, fall begins on September 1st, in the past this also meant the fall semester of school began as well. However these days school seems to be starting in August and earlier and earlier in August each year. According to my handy dandy desk calendar, fall begins on the Autumnal Equinox, September 22nd. There are two equinoxes every year – in September and March – when the sun shines directly on the equator and the length of day and night is nearly equal. Each kicking off fall or spring respectively in the northern hemisphere. According to me, Fall begins when I take down the Bunting after Labor Day. There are not many opportunities to decorate in the summer. 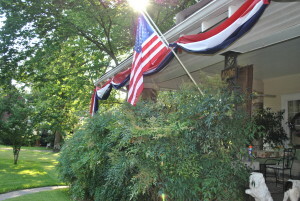 There are birthdays and in more recent years Cinco de Mayo but for as long as I can remember the only nationally recognized reason to decorate in the spring and summer is Patriotism. 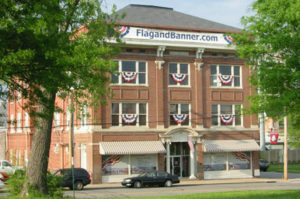 Starting in May with Memorial Day, June for Flag Day, July for Independence day and last September for Labor Day (August is just a lost month, too hot for anything ). Each year I grab a ladder with staple gun and yards of bunting. I use a combination of premade and rolled bunting. This year I decorated the garden with 1.5 x 3 ft. premade bunting called full fans that were easily stapled to the lattice. To make fans fit in any space, measure your area and overlap the top heading 1 to 6 inches as needed for a perfect balance. On the main house I swagged a whole roll of our printed bunting. I didn’t bother to sew anything. I stretched the whole roll in front of my house on the lawn to make sure it was long enough. Then I decided how far apart to make the swags, mine are about 3 feet. Next I counted the swags to know how many tie backs I would need. The ties are 6 inch wide strips I cut from the ends of my rolled yardage. No need to sew the raw edges because it’s raveling is minimal. Now start in the middle and work towards one end making adjustments as needed. Whatever you did on one side you can repeat going in the other direction. 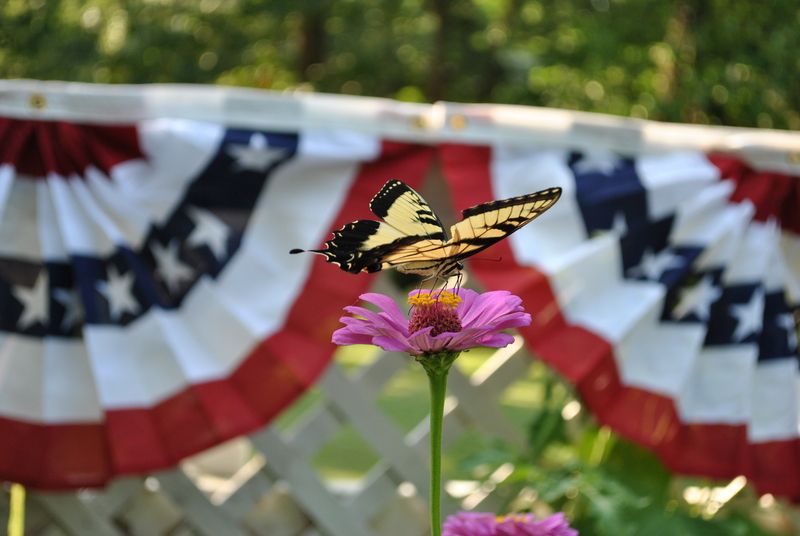 Throw in a flag display or wreath and voila; you have your summer decorations done! It’s now time to relax and enjoy the warm weather for months or at least until after Labor Day. 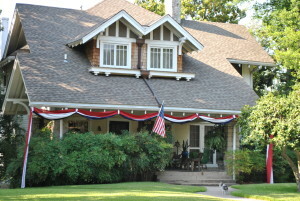 Bunting can also be used for any holiday, not just the patriotic ones. Our bunting, sold by the yard or by the roll, comes in a rainbow of colors to decorate for every holiday. Get orange and black for Halloween or pink for Breast Cancer Awareness this month of October for example.